Rainbow Dash flitted happily above the road, darting left and right in her gleeful flight. She was feeling horribly impatient to get there, but she was trying really, really hard to be patient for her friend. Twilight wasn't used to having wings, after all. Once more, she darted down, grabbed hold of Twilight's tail, and tugged her rear end higher up. "Keep it up, Twilight!" she said through her gritted teeth. "Flap harder! It'll really be easier if you pick up the speed a bit, then the wind will straighten you out!" She flit back up above Twilight, barrel rolled over her head, dove down and skimmed the earth just under the princess, and came back up on her right hand side. "Aw, yeah! You're gonna love it, Twi! I've got *just* the right mix of brown whipped up, and the grey too! I heard about these techniques at Daringcon, that I used for the mane, and it looks *so* *awesome! *" she paused in mid air and tucked her hooves up under her chin as her voice cracked in excitement. "Maybe a little messy but it's my first time trying it and I can touch it up a bit and keep your tail up!" She grabbed Twilight's tail and pulled it up again, helping her friend gain that bit of extra altitude. They were almost there! Just past Sweet Apple Acres, and they'd reach the workshop! Carrot's workshop! She couldn't keep lead and pewter figures in her cloud home, so Carrot had selflessly offered to let her use a table in his workshop! And this was the first time she had gotten a slot on Twilight's schedule to show her the AWESOME Daring Do figurines she was painting! Twilight believed she had mastered the art of the leisurely flight from one end of her library to another, and had started to complete courses in flying around town safely. She got her fair share of looks from pegasi but underneath it all she knew they understood the trials and tribulations of a beginner flier. Assumed they did. Hoped they did. But she had her pace and when she kept to it she flew well, even by her own meager estimation. The only problem with her pace was that it was about a quarter of Rainbow's pace, which meant that the trip was more stressful than it should have been. The first few times had been understandable. The last few, not so much. When Rainbow yanked her tail up, it was all Twilight could do to not teleport back to the library. "Rainbow Dash, I'm flying fine!" She shot back, more than a little pleased that it hadn't happened in town. She felt embarrassed enough having her point out every little flaw in her flying in a casual setting, let alone having her constantly tug on her tail. In order to not turn the pegasus into a frog or some other random act of anger, Twilight focused on what they were doing. It was going to be a fun day. Carrot Fields was a local farmer who Twilight knew to some extent, if not all too well, but was close with Rainbow Dash. They were all fans of Daring Do and today was a rare day where the planets were aligned and schedules were clear for a Princess, a farmer, and a weather control pegasus on the edge of the Everfree. They were going to get together and by Celestia they were going to geek out. It was going to be glorious. Tail pulled up again- it would be glorious, assuming they got there in one piece. She remained positive. "Well...I'm excited to see what you have cooked up. Can't say I ever took you for an arts and craft sort of pony, so I can't wait to see the figurines. And it was very nice of Carrot to do that- Daringcon, right? Picked up some impressive techniques and an impressive friend. How'd that happen?" Twilight asked as the pair made their way past Sweet Apple Acres and closer to the workshop, which they were in no short order- no thanks to Twilight's pace, no doubt- arriving at. Twilight gleefully landed with grace near the door beaming at Rainbow Dash. Every landing was a crash avoided! Twilight knocked on the workshop door, excited to have a chance to geek out. It was a warm, sunny day spring day, one that was much more conductive to relaxing than to work, but Carrot Fields knew that the daily chores always came first in the life of a farmer. Fortunately for the gray earth stallion it was between harvest times for the farm’s many kinds of carrots, making the day's workload an easy one. The only chore he had remaining was finishing bringing in the watermelons into the barn from their patch. Like most farmers, the Carrots grew a variety of foods beyond their farm’s main produce: Pumpkins, wheat, potatoes, and watermelons were the main produce in that regard for his small farm. There was even a little dark shed in back where he grew a couple types of mushrooms inside. Carrot just unhooked the cart from his body when he heard a knock on the workshop door. He wasn’t expecting guests, and just about anypony who came to their home would knock on the front door of the house, not the door of the shop, which was little more than a small side extension of their modest barn; it was unusual. Maybe it was one of the local foals, perhaps Applebloom and her crusader friends, who were not an uncommon sight out in the fields. At least he hoped so, given he worked outside all day which made his coat dusty, his long ruddy mane one long wavy wild mess, he certainly wasn’t presentable to strangers. Suddenly his question was answered, she did not come alone, she brought… Oh Luna above! Princess Twilight Sparkle!! What, why is a princess here?!? Why now, when he looked such a mess!? Carrot just stood there for a couple second, silent and awkward, his mouth agape at the unexpected sight of the lavender alicorn before realizing what he was doing.. or not doing. Bow you dumbtail, bow! Purple Haze was a bit slow today - she'd already been out doing chores, of course, and breakfast had been more of a snack, really, and lunch was too far away, so she was pondering a nice brunch. Nothing complicated, she just wanted something warm ... perhaps some garlic-roasted carrots. or a nice carrot omlette. Simple. So the little filly's green coat was brushed clean, her purple-and-orange hair tied back into a ponytail to keep it out of the way. The cupboards flew open, the oven was lit, four pots and pans were on all four burners of the stove, and she had on her little apron and was busily chopping away at carrots in a frenzy of activity! How could her big brae have failed to tell her that there was going to be a PRINCESS over to visit?! Oh, she had to prepare a proper meal! Ohmigosh ohmigosh ohmigosh! Dash nodded approvingly of Twilight's landing, grinning a grin of shared victory with her friend. She laughed softly at the knock. "Oh, that's not-" she started to say, but cut off as the door opened. Her lips quirked, and she let out an indelicate little snort of laughter at Carrot's face - a snort that ballooned out into a full on "BUAHAHAHA!" of laughter as the farmer pony went completely mental at seeing Twilight. "Oh, get up!" she laughed, punching him in the shoulder. "It's just Twilight!" She giggled softly. "She's not a *majesty* anyway! It's highness for princesses! Comon, I'm showin' her our miniatures! I bet she'll want to play with us when they're done!" She turned to grin at Twilight. "You'd wanna play some Daring Delvers, right? I'm gonna make terrain and stuff, too! How hard could it be?" Carrot Fields immediately assumed the position of many others, bowing to Equestria's newest Princess before Twilight could tell him there was no need. It happened everywhere she went and while she had met it initially with a degree of concern and even uneasiness, she was accepting it now as part of the deal. It still made her a little uncomfortable as she liked to think of herself as the same as anypony else but it was one of the gentler reminders that no matter the delusion she invested into, she was unique and would always be so. didn't mean she had to always like it and Rainbow Dash was right to let Carrot know that. Also made it slightly easier to transition into her reason for being there, even if having somepony bow to you made it awakrd enough for three. "No reason to bow, Carrot. Here as Rainbow's friend, not on any sort of official business. She has said some wonderful things about you," Twilight said as she entered, wanting to make sure that the topic was switched away from her. That wasn't why she was here. They all shared a common love and appreciation for a very nerdy subject matter and beyond all things they were here to geek out over it. The fact it was real, that Daring Do was real, didn't lessen the sheer geekery that was about to explode in the workshop and make it unlivable to all but them. A small flurry of sounds from what was likely the kitchen judging by the sounds of pots and pans, somepony else- probably his sister, whim she hadn't met. The little one was probably shy or busy, and Twilight didn't want to impose. besides, Rainbow Dash mentioned Daring Delvers! Twilight remembered that game very, very well. As a filly in Princess Celestia's school, there were few things she did for fun that could attract people to hang out with her. Getting the Daring Do books before they released and indeed, many other materials- comics, radio plays, etc.- early was a way to gain at least a few nerdy friends. And Daring Delvers was another in a long line. When the game was being made she had received loads of pre-release materials and was even a playtester and as a result she had a lot of fun. Of course friendship really didn't follow- she knew some nice ponies who were very kind to her, but her attention was so laser focused elsewhere fewer ponies ever tried. She believed now that they kept her around mostly for her access, but she didn't really blame them. It had been her lack of effort, not theirs, that sunk any potential they had. Point: She was always up for a game. "That sounds marvelous, Rainbow Dash. What edition do you two play?" She asked earnestly, a certain pep in her trot sneaking in. Carrot Fields felt quite a bit embarrassed as Dash laughed at his deference towards the princess. He knew it wasn’t that she disrespected royalty but because the pair were close friends, but on the other hoof Dash should have known those who weren’t so close to the princess would treat her with the respect that she had earned, even if he was being a bit too obeisant about it. “er, weel Ah hae ne'er mit a princess before; sorry abit 'at yer maj- er highness, er princess Twilecht Sparkle.”Ugh, he was still being too formal, the princess wanted to be treated informally! “umm, Ah guess Ah can jist caa ye princess Twi, er Twilecht, 'at be alrecht?” That was informal, sort of, well as informal as the ruddy maned stallion could get,Well that and not bowing. As he followed the winged pair in, Carrot tried not check them out… Too much. An attempt at modesty that was easier said than done given how attractive his guests were. Dash herself often reminded him of the beautiful ponies who populated the various posters of his shop. Carrot wasn’t thinking about the walls until they were all inside. Although much of the room was full of the usual equipment one would find in a workshop, it also stood out has the stallion’s personal haven, well his and increasingly the rainbow maned pegasus’. In the center stood a large wooden work bench, covered in an old off-white tarp with blotches of every color of the rainbow soaked into it. On top sat several Daring Do miniatures in various stages of finish. More noticeable though were all the glossy, professional posters: All Wonderbolts, all mares, a few were of the winged beauties flying, but most were of them in very alluring, and rather steamy pinup poses. The only exception was a crud but colorful image on regular paper that Purple Haze drew at school, and got Spitfire and Soarin' to sign as a gift for her "big brae". Carrot recalled how red he was when Dash first saw his poster collection, relieved that not only she wasn’t bothered by them, but even admired them as a fan. Of course having Dash see them was one thing, having a princess see them was something else entirely! The stallion froze; there was no way he could prevent Twilight from observing his.. obsession. “Er, uhh, Ah can explain yer high… Er Twilecht, Princess Twilecht”. Oh? How are you going to do that, dumbtail. "Oh, I dunno about editions - just the one I bought the other month at the convention! I haven't had a chance to dig into all the older editions yet, but I want to! I just need to get a handle on this one, first!" Rainbow Dash followed the two in to the workshop as Carrot was saying he wanted to explain. But he was talking so SLOW and stammery! What was wrong with him? She flared her wings and darted over to float over the table in the middle to explain. "Yeah, see, this table isn't usually where I'm supposed to be working, but Carrot said I needed more *space*!" Her voice cracked a bit, but she didn't care. She flitted over to one corner, where a smaller workbench was covered in splattered paint that also seemed to have managed to get onto the walls - a rainbow of colors in haphazard splotchyness. "This is my workbench, see!" She gestured to the wall, where there was a single poster of a Wonderbolt Stallion. "When I saw all his REA Recruitment Posters, I had to bring *mine* out, too! I had this hanging on my wall when I was a filly!" On the poster, Cirrus McCloud stood proud and tall, wearing his Wonderbolts dress uniform with his trademark blue-and-white tartan kilt, standing proud and tall at the top of a solid stone border tower. "But when he saw how fast I was painting *my* miniatures, Carrot said he wanted to give me more room for all the ones I was sure to get to! So he laid out a tarp over the center table!" She flew back to the center table, then, her mouth flying as quick as she could. "Man, those colts at the con didn't know what they were talking about! They said a mini could take days to paint properly, but I got this one done in an hour, tops!" She grabbed up one miniature - and it was actually a miniature of Dash herself, from the most recent book! Though the mane was more brown than rainbow-colored, and slopped a bit over the blue coat, and ... well ... surely that cutie mark would represent a lightning bolt in some ... very ... vague concept of a lightning bolt. "I gotta touch it up, the colors kinda ran into each other a little, but isn't it awesome?!" On the table was a couple dozen other minis, all in similar states of rushed prep, slopped paint, and colors running into each other. Her little pots of paint were laying all over the table, half of them still open from last time she'd been painting, the tops of the paint all skinned over and drying out. Carrot was starting to calm down. Starting. Well, at least he was willing to try. She knew far too many ponies who got caught up with her title and didn't invest nary a glance at the desire of the pony who had it, but at least Carrot was making that effort. A stammering, almost embarrassed sounding effort, but it was the thought that counts. Twilight laughed as he worked himself up for the name. "Twilight will be fine, Carrot Fields. By the way, it has been a while since I heard that accent. Fet Loch, I presume? Wonderful place, I have been there once myself when i was just a filly. How long have you lived in Ponyville?" Twilight asked as they entered the workshop. Indeed, it had been a fun family trip when she was just a little filly, even before she had set upon her life's course after seeing Celestia at the Summer Sun Celebration. It was one of the more unique places in all of Equestria and that didn't even count the almost absurd friendliness she remembered. Carrot seemed to still have that noble trait within him and his own sense of friendliness was memorable. A bit stuttery and awkward and something seemed off and she couldn't quite place her hoof on it, but in the end it was sweet. Just as 'sweet' as the workshop. There was more than enough space in here for ponies to get to it and indeed it looked like Rainbow Dash was making great use of her new space. The paint was splayed out in a rainbow array around her workspace, thankfully Cirrus McCloud remained untouched. Relatively. A few tiny dots seemed to smear against his brilliant thighs but such thoughts were slammed shut as swiftly as they arrived, even as she turned to a stammering Carrot. Yes, there were certainly posters that marked this as a stallion's room all around. She knew the type. Shining's room was similarly adorned at one point as he started his fascination with the Guard, but as she got older she realized there was something else at play. They had a certain, uhh, appeal and Carrot's inability to explain it and going back to his stammering self told the story. Well, it was a stallion's room by trade and a stallion had certain, well, desires. And she didn't blame them, the posters were certainly...well, they were what they were. She just nodded towards him with a knowing wink, hoping against hope he would just calm down. Thankfully, Rainbow Dash was focused on the very important topics of miniatures. She certainly did a job. It wasn't a good one, but painting could be incredibly difficult with hooves. She heard that the best pegasi painters were experts at using wingtips but dash didn't make Twilight think of the painting greats. The colors ran together until they all seemed to be a few steps from brown and the scheme itself showed more promise than it did success. But it still would have taken a good effort to get as far as she had and it wasn't as if Rainbow was renowned for her fantastic paint skills. Twilight levitated the model closer and inspected it aside from the paint job. The new Dash miniatures were going for a high price in some corners thanks to the release of the book and the look that closely mirrored a certain famous pegasus. Twilight should know- she had a collection. It was well put together so there was that. She put it down and looked at the rest which were all in a similar state. "An hour is really fast. Good job, uhh, so far on it...Rainbow, if I were you I would make sure to take my time on these. If you do it right then you'll have something to treasure for decades. Just a little bit of work on...every aspect of painting...and you'll be fine. I would probably get some more thinner and paint brushes so the colors don't run as much but you're already better than I was when I started! You have a good set going so far. Do you have any of the third edition miniatures from the release of Crystal Caverns?" that was a lie but Twilight wasn't above a little white lie every once in a while. She turned back to Carrot. Okay, so they had the newest edition of the game and some nice miniatures, but what about Carrot's contribution to this nerdy endeavor? "It was really sweet of you to give Rainbow so much space. What prompted you? And where are your own miniatures?" Carrot Fields was both excited and relieved, especially the latter, when it became obvious that Princess twilight Sparkle was quite informal and preferred to be treated as such. Truth was Carrot never talked to a princess before, only seeing Celestia from a small distance when he was in the R.E.A., and she only talked to his squad as a whole. She was beautiful and elegant. Twilight though was adorably cute and down to earth, which made him feel a bit more at ease. It also helped that she recognized his accent! "That’s reit yer maj- er, Princess Twilecht. Almost nae a body else in Ponyville haur recognize whaur Ah am frae, they jist hink 'at Ah “talk funny” ur “foreign”. Mah sister, Purple Haze, an' myself only moved haur a year ur sae ago now; it was time fur me tae start mah ain homesteid ance Ah got it ay th' R.E.A." He was feeling much more at ease now. Knowing that she knew of his valley, and it would appear, also unfazed by his wall décor, he finally felt calm, well as calm as he could reasonably be expected to be around a mare he had developed some real feeling for, and a princess. “Whit did ye hink ay uir wee toon an' valley, Princess? They’re hostin' th' Heelain Pony Games next month! real fin, ye main enjoy watchin'!” It be pretty cool to have a princess as a guest of honor. Of course the conversation turned back to the miniatures Dash wanted Twilight to see. The princess’ reaction was much like Carrot’s, who just smiled rather awkwardly. Still he was happy for Dash, and happy she wanted to spend time at his place, making herself at home, even if it could get.. messy; a lot. “Yeah, yoo’re fest! usin' speed tae er, tae complement ab elegant simplicity an' iconic style ower th' normal detail 'at most ponies spend days daein'.” That sounded supportive, right? He hoped so, even if the paint job in reality was rushed and amateurish, she was still new at this and he did really like the fact she would often visit, even if it was more often than not, unannounced. Of course Twilight asked him about his own collection. Truth was he didn’t know how to paint so his miniatures were just metallic looking, as in unpainted metal. “Er, weel mine ur ower haur oan th' side, Ah ne'er actually painted onie, jist don’t hae th' skill fur it, but Ah dae loove collectin' them.” If that wasn’t embarrassing enough, the princess wanted to know why he was so accommodating. “weel we mit at th' lest Daringcon an' Dash haur didn’t hae a place fur workin' oan them in 'er clood haem, sae ye ken, jist wanted tae be a guid neighbur an' aw tae somepony fa liked Darin' Dae too…”. He blushed a little, as it was more than just being neighborly; there was just something about the blue pegasus he found more and more attractive. He wasn’t going to say that though! She threw her hoof around Carrot's shoulder as he discounted his own miniatures-painting ability. "Pffffft. Doesn't matter if you don't have talent, you don't get talent by just sitting around thinking about it! You gotta DO it! Even if you mess up, then you do it again, and again, and again! Then eventually you get it right! Can't let a little thing like crashing keep you from being AWESOME! I didn't get as incredible as I am by holding back! Sure, your miniatures probably won't be as rad or as cool as my first miniatures are. And certainly not as radicool" she turned to Twilight to explain in a quick undertone, "A gestalt combination of both rad and cool that's greater than the sum of its parts,"
She grinned broadly. "I don't have the Crystal Caverns set YET. See, I got these at Daring Con, which was *awesome! *" her voice squeaked in excitement. "But I didn't realize there'd be so much amazing stuff there, so I didn't have as many bits as I'd have liked! So I just grabbed a bunch of paints and the base set. Paints are *expensive! * But I've got more on order, and more paints, too. The paints don't last too long, it's like I only get through half a bottle and it's already too old and dried-up to use, no matter how fast I try to paint. But soon I'll have the Crystal Caverns set, the Dazzling Desert set, the Hazardous Harem set, the Sinister Skies set, and the Wayward West set. And I got the mega-fan combos so each one comes with a costume piece, a concept art book from the designers of the miniatures, and an extra Daring Do mini relevant to each collection! So I'll have all SORTS of Daring Dos to paint, and more stuff to wear to the next con!" She hugged an forehoof around Carrot's shoulder again, wriggling happily with her wings were flared out from her excitement, her eyes sparkling with delight. "So you're gonna see a whole lot more of me around here! Isn't it AWESOME?!" Carrot warmed up and calmed down quickly once Twilight told him she understood his accent and knew Fet Loch. It didn't surprise her. Carrot seemed naturally to be a shy, perhaps over-sensitive stallion who had moved to a new part of Equestria. Alone with his sister, his customs, accent, clothes, phrases and ways of living were indeed foreign to a great many ponies of town and had him at a disadavantage socially. It didn't help matters that unlike Sweet Apple Acres which had easy access to town by the simple nature of the town's founding, his farm was a bit off the beaten path. Not hard to reach per se, but more isolated than Sweet Apple Acres and a grand deal more alone time as a result. less chances for socialization perhaps, which led to a somewhat more awkward integration into town? No matter though. He was a good stallion and in the end, he would fit right in despite his culture clash and would find his little piece of peace beneath the stars. That was what life was all about for some ponies, and in the end, it was a beautiful end. "I wouldn't worry about it too much, Carrot. When I first moved here, I thought they spoke funny and they thought the same. In time, you'll integrate a little and they'll understand a lot. Besides, as somepony who was in the REA, I'm sure you can handle a few rough comments," Twilight joked, knowing full well that no matter what the ponies if Ponyville said they wouldn't be able to touch the scorching hot language of a drill sergeant. The opposite of peace, which is what he would find in Ponyville. Unluckily for Twilight, she had none of it. His mention of the Highland games only drove that home. It was a Fet Loch tradition dating back generations and Fet Lochians of note to Equestria at large by and large made their name at the games. They were less organized sporting events than they were a burst of activity centered around feats of strength, speed, daring, cunning, and a certain Fet Loch spirit. It was agreat attraction for the area and was what most people associated with the name Fet Loch. It wasn't the biggest event in the East nor was it the most prestigious, but the longevity and character of it had made it very popular an as a result the Royaltyhad made sure to have some sort of presence there to kick things off. Keeping your hoove son the pulse of Equestria was the sort of duty that seemed benign but became incredibly critical as you realized that knowing Equestrians was central to ruling Equestria. "Funny-" Twilight began before Rainbow Dash added her two cents, her fillyhood crush and another Wonderbolts icon. Twilight nodded along. She wasn't as familiar with that particular Wonderbolt, but she knew the Games well. "Yeah, he is one of a few who really got their start there. The Royalty is sending a representative to the games in an unofficial capacity, and I'm probably it," she said simply, the pregnant pause holding the notion that it was because it was considered one of the less important activities and Celestia and Luna had greater tasks. Still, it would be a nice vacation. And with that, the trio turned all their attention to the nerdy venture that gathered them there. Few things were better than nerds nerding out about nerd topics, and it was one of the last bastions of normality for Twilight in a life filled with everything that opposed quaint pursuits. It was good to see that Dash was keeping up with as many sets as she could, especially Hazardous Harem. It was harder to find that set outside of some speciality shops after the uproar over some of the materials, but that just drove the price up on the secondary market. If Twilight ever needed to bail Royalty out of financial trouble, she had a mint first edition printing of the materials in the set as well as near-mint playing pieces. More important than though was an odd sort of affection she could feel between the two that was a bit understated at first but was growing on her as she spent time around them. He blushed as bright as the red sun of Saddle Arabia and she hugged him as affectionately as Twilight had ever seen a pony hug another. Of course, they were all just excited about Daring Do. Or were they? "Paints can be awfully expensive, but there is actually a few simple methods you can use to make your own paints. Done correctly, they can be cheap, easy, and fast. I'll send some of them over for you to review. Your access to Cloudsdale should make portions of it easier. It might even be...radicool," she smiled awkwardly, hoping the angry Goddesses of language did not strike her where she stood for such an egregious offense to language. Of course, that smile was probably lost in another overly affection hug- hmm, something was certainly there. Further investigation required. Carrot realized he was starting to ramble on about stuff that probably wasn’t of much interest to Dash or Twilight, so he just stopped there. He was however excited to hear that Twilight Sparkle may indeed be the games honorary guest. Just as wonderful, it seem Dash also was aware of the Highland Games of the valley, better still, she seemed to think positively of them. Maybe he could get her to come along next time… “Weel Princess Twilecht, if ye ur th' royal representatife at th' next games, i’ll dae mah best tae be thaur tae represent Ponyville, an aw as th' fowk! Nae aft we gie somepony sae cuuuu- er, a princess tae be uir official guest!” Carrot just smiled awkwardly, and blushed, why was he prone to say every silly notion that popped in his mind about the mare in front of him outloud when it came to talking to them? At least this time he was able to stop himself, the dumbtail. Speaking of cute mares, Carrot couldn’t help but feel Rainbow Dash’s enthusiasm for her multitude of Daring Do sets, it was just.. Infectious. In a single convention, she had managed to snag more sets than he has owned his entire life, and the blue pegasus was determined to “paint” them all here, in his workshop. Such a thought would normally horrify Carrot, this was his special place after all, but when Dash put her arm around him, bouncing excitedly so close to him he could feel it, all the shy stallion could first do is blush and think, yeah, it would indeed be awesome. “Well… Rr, um, sure Dash, yoo’re aye welcome tae come ower an' wark oan yer miniatures an' mince. It is whit friends ur fur!” Ugh, that sounded so lameeeee! Oh how his sister would berate him. He knew he wouldn’t let most friends have such free reign, just for some reason it felt fine though to make her an exception. Rainbow Dash rolled her eyes as the two kept talking about Twilight's trip to Fet Loch. Not that she could easily make her way through Carrot's accent all the time. Not that she'd want him to *stop* talking in that accent, it was just like Cirrus McCloud's! She coulda listened to that Wonderbolt talk all day. She stared blankly into space for a bit as the other two talked to each other, remembering when her dad had taken her to see him after a Wonderbolt event and she'd gotten his autograph... Best Day EVER! Her eyes widened as she saw the miniature he was offering her. She snatched it from his hand, holding it on cupped forehooves as she babbled, "Ohmigosh ohmigosh ohmigosh! This ... is ... AWESOME!" She circled up into the air with a quick rising corkscrew, burning off some excess energy, then squealed eagerly. Then she settled down a bit and tried to remember to be polite. "But this must be super-rare! And only in your hometown! I really couldn't... butIfYouInsistI'llTakeItEEEEEEThankYou!" She hugged him happily and then circled around to show it to Twilight. "See? Ohmigosh, you know how hard it'll be to get his tartan right? Gah, it's gonna take FOREVER! Like, two or three hours! Ohmigosh, that makes me think of an AWESOME story idea! Like, there's this big museum showing in Fetloch and Daring Do shows up to make sure nothing happens to the display and then some shadowy bad guy shows up with a bunch of minions and they start to get the best of Daring Do when one of the museum goers suddenly jumps into the fray and hooves flying everywhere and who is it but CIRRUS MCCLOUD who comes out of retirement for ONE! LAST! MISSION! They're trapped in the museum with the crooks and there's a bunch of civilians held hostage so they can't just jump in and fight, and they'll sneak around and use all the ancient stuff to make clever traps and everything! And then an awesome aerial chase across Fet Loch! I'll call it, like... Fly Hard - Artifacts of Doom!" Twilight was relieved to hear that he was having a good enough time with the ponies of town and thet he had few if any issues fitting in or being accepted. Ponyville was a very accepting town and it wasn't as if she had worries of a great degree. But it was always interesting to see ponies from different cultures mingle and what came of it, and Twilight herself had a bit of difficulty adapting to Ponyville. It was good to hear that was not the case here. "Well, I am happy to hear that. Ponyville could use a bit of variety I think," Twilight finished with a smile as he started discussing how he was going to try even harder during the games because of her. Well, she was just happy she could inspire ponies. That was the real job of a Princess as Equestria was made up not of the will of the Princesses, but the hopes and dreams of the normal ponies. If she could help just by being there, she was doing her job. "Well, I'll make sure to keep a look out for you during the games, Carrot," she stated as she followed him to where he was leading them. 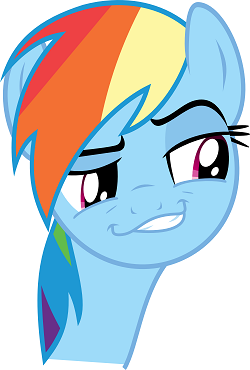 And then Rainbow Dash was in her face as suddenly as a lightning storm in the Everfree. It took a few moments for the Princess to catch up with the mare who was almost as fast in speech as she was in flight, and even then it only half grabbed her interest. Carrot and Rainbow Dash, together? That would be a strange turn for Rainbow Dash. She had wanted a pet that could fly and had settled only after great action on the part of Tank. A relationship with a pony that could never walk in her house was something that Twilight had never considered for Rainbow Dash. Not for a day, not for a minute. But if that was the case, it must be serious, serious enough for a pony so devoted to flight to keep her hooves firmly planted on the ground. Luckily for all involved, Twilight was a superior multitasker and followed Rainbow Dash's plan closely. "Well, I like that story. But if we do that story, we need to get the Mystical Museum set out, pronto! That and the Fetching Farmland set, for Fet Loch," She finished with aplomb, her mind running the calculations of love and turning up nothing but . Carrot Fields felt a slight pang as Dash snagged the figurine from him. How could he have given that away?! He'd never be able to get another one! They were limited edition! But as her curvy figure circled up into the air and squealed so adorably with the cutest of smiles, he couldn't help but have a big, goofy grin on his face. Totally. Worth it. And her story idea sounded pretty neat, too! It reminded him of one of his many own... "Yoo know, Ah actually hud a story idea kinda loch 'at th' other week, except it wasnae wi' Cirrus Mcclood. Ah hud thes idea whaur Ahuizotl an' Queen Crysalis hud pit these artifacts aw aroond Canterlot, an' if Darin' Dae didne dae jist as they said, 'en they waur gonnae use them tae release a hoarde ay all-devoorin' gerbils oan canterlot tae eat ben th' supports an' send it crashin' doon th' moontainside! sae Darin' Dae got teamed up wi' a changelin', an' he was supposed tae be keepin' an eye on 'er tae make sure she didne gie onie clever ideas as they hud 'er tryin' tae fin' thes super-secrit artifact 'at hud gotten hidden in Canterlot durin' th' city's foondin', but durin' th' traps an' adventures, an' they hud tae sae each other's li'es ah few time, an' 'en he started learnin' 'at loove tastes e'en better when it's given an' nae stolen, an' 'en they-"
He stopped suddenly as he realized he had one foreleg around each of the two mares, hugging them close in his excitement as he regaled the story ... Dash smelled very active, like a damp spring morning, like usual, and he couldn't help but notice that Twilight had that wonderful scent of dusty old books. And he was about to describe his secret Daring Do / Changeling romantic fanfic idea! What was he THINKING?! He coughed softly, his cheeks burning red. "um. sae ... hoo abit, uh ... anypony ready fur lunch? We shoods totally gie lunch!" Rainbow Dash couldn't help but give a knowing smirk at Carrot Fields as he regaled them with a plot that could only be going one place in Rainbow Dash's mind. "Yeah, lunch sounds awesome. We should head to Hard Rock's Cafe and see what the Rock is cooking." Rainbow Dash had spent about a total of ten seconds on the floor the entire time she'd been in this workshop, but as Twilight's words belatedly hit home, her wings stopped their slow beating and she lowered to the floor with a stricken look. "Oh no! I haven't even ORDERED the Mystical Museum or Fetching Farmland sets! Ohmigosh! How could I have forgotten the Mystical Museum set? That's ... that's ... VITAL to most Daring Do stories!" She grabbed Twilight by the shoulders. "You've got a set, right? We can use yours till I can make a new order, right? Ohmigosh, I haven't even thought about who I'm going to get to PLAY with these! You'll play, right Twi? Of course you will! And you'll teach me how to make my own paints, like you said? Cause I'm kinda tapping out on all this AWESOME stuff I saw there! Oh, thank you, Twilight!" she said, and twirled around with her friend up into the air, holding her by the forehooves, not really waiting for an answer because she was already sure what it would be. "You're the best!" She settled down, then, and floated up in the air, setting her little Rainbow Dash figure on the shelf very close to the little Cirrus McCloud figure, grinning as she pictured Cirrus McCloud putting his hoof on her shoulder and saying, "Ye're Wonderbolt Material, kiddo!" "Right!" she said, "Now I'm hungry!" As if that was a surprise - she was always hungry. "Let's go!" It no longer required somepony related through marriage to the Princess of Love to see the intertwining of hearts set in motion before her, Twilight beholding such casual displays of intimacy that Rainbow Dash would never dare share with others the sort of [physical affection she was sharing with Carrot. He acted very much in character and in-line with how twilight would imagine he would at if he were in love, and any theory of hers supported by evidence was fast tracked to fact-hood in the quick-acting recesses of her mind. The revelation was beautiful, amazing, and nearly giggle inducing. She wouldn't reveal what she knew to others outside of the shed as she figured it was their prerogative to announce their relationship to the world but that didn't stop Twilight from having some very simple desires, such as knowing how exactly they felt and wanting to explore carrot's financial, legal, and healthy history in greater detail so Twilight would know for certain whether or not Carrot would make for a good husband. Rainbow Dash deserved somepony of high caliber, after all. Speaking of high caliber, both of them had some fantastic imaginations! A lot of Carrot's story would have worked well if folded into the more structured confines of Rainbow's idea, though the romance angle would have to be dulled. Their overflowing river of love would have to be temporarily stopped somewhere for the sake of others, lest whole populations be submerged under their shared exuberance. But even the fact he hugged both of them didn't stop his story from being more charming than somewhat unnerving, and she wrestled herself away with a smile. He was a very silly colt, and Rainbow acted like a very silly mare- and one who was worrying herself over nothing. Twilight was going to put some hearts to ease tonight. "Don't worry, I have both sets and it would be a pleasure to play-" she didn't really have much of a choice after being thanked so excessively anyway, "and help you improve your already...legendary art skills. After all, everypony knows I'm the biggest Daring Do fan of all," She winked as Carrot's offer to stifle his own awkwardness pierced her defenses. Lunch would be very good. "Ah, that'd be very nice, Carrot." Carrot Fields relished once more the relief and joy of having fellow adult fans of the series as Rainbow Dash gushed over the numerous Daring Do collectables, even if she was in a slight panic over not yet owning some of the sets. His sister often poked fun at him about being a grown stallion with a 'foalish egghead hobby' that she was too old and too cool for. But here were two bonnie mares who were just as big of fans as he, if not more so! What could his sister possibly say to that? Carrot's smile grew when Dash excitedly mentioned the Fetching Farmland set. He didn't have as many sets as she, or apparently Twilight, had, but that was one he made sure to get. Now he had his chance to be a bit of a hero to the pegasus mare that he was finding himself pretty attracted to, "Weel Ah hae one ay those Fetchin' Farmlain sets, Ah can pull it it as suin as we gie back frae lunch! Tt'll be stoatin! Yoo'll loove it dash!" He didn't have the other one though, but if the princess was the fan Dash played her up to be, certainly she must, with all those royal connections she must have. Carrot opened the workshop door for the two mares, slightly blushing, "Th' cafe is only a 20 minute donner frae th' farm haur, Ah heard they hae limitless horseshoe fries wi' aw kinds ay sauces." Truth was he never got a chance to try the joint, but ponies always talked positive about it. He always worried he would have to try the place out alone, but now he had two companions with him. And here he was, going to try it with not one, but two cute mares, one a princess, and the other a Wonderbolt and Daring Do enthusiast who were fast becoming his friends! Rainbow Dash snorted at Twilight's declaration as she went to get the door for her friends. And darted out ahead of them, flitting up into the air once more. "Pffft! The biggest fan?! Maybe if you're counting the height that extra-long horn gives you! I bet you can't even tell me how many days it is till the next book comes out!" Her wings beat lazily as she led the way down the road, all too used to waiting on ponies who had to walk the slow way ... "Just thought of something - it'd be cool if whenever we went anywhere you could do that cloudwalk spell, Twi, then I could grab a cloud and zoom us around at top speed! It'd be AWESOME! And think of the stunts we could do! OK, so I been lookin' through the rulebooks, right? There's a lotta rules, but it's not as bad as all the little fiddly bits of the weather manual. Just kinda disappointed that despite Daring Do being a pegasus, the rules show a very two-dimensional way of thinking. So here's my idea for some house-rules..."
The trip didn't take long, as they were reaching Hard Rock's Cafe. "Ooo, look! Special on pie today! Do you like pie? I'mma get me some pie. They've got this sorta smoky potatoe pie, and a carrot pot pie, maybe have a slice of each, then what to have for desert? They have strawberry pie, and they got blueberry pie, and they got apple pie - actually, it doesn't matter what kind of pie I have. They're all good!" Behind the counter was a very tall, dark, powerfully built stallion who was busily serving ponies their food. "Hey, there!" Dash cried happily, "'sup?" She flitted over the tops of the other patrons to give him a hoofbump. He returned it while raising one brow curiously, not responding in any other way, then just looked significantly at the end of the line. "Right!" Dash returned to the back to wait with Twilight and Carrot. "You been here before, Carrot? Check this out, the wall over there?" She gestured to a wall that had two portraits on it. "Hard Rock will give a free meal to anypony who can beat him in a contest!" Twilight smirked, Rainbow Dash calling her bluff in the worst way possible. She was not only a Princess of Equestria who held a powerful command of magic, after all. She was also a librarian with a near encyclopedic knowledge of upcoming book releases. Rainbow Dash picked the wrong Princess to contend with for the title of biggest Daring Do fanatic if that was her angle of attack! "Seven months, twenty days...and I'd guess fourteen hours and sixteen minutes judging by the sun. Of course, the third edition paperback of Daring Do and the Gardens of Equestria hits shelves in only two months, but you already have that one," Twilight said, a bit of cockiness easing into her voice naturally. She should knot after all. Twilight had sold her own copy, after all. In any case, Rainbow Dash had a short inquiry regarding the cloudwalking spell that twilight was more than happy to consider, even if immediately Rainbow continued on to such a degree that Twilight couldn't but in. The answer was relatively simple: No. Cloudwalking was a spell that still took a lot out of her and it was not something to be used willy nilly, as the possibilities for failure were many. She could and would cast it when the need arose, but didn't feel comfortable using it otherwise. But that was just the tip of the dash iceberg. Dash had a lot of ideas on how to 'improve' the game. More to the point, how to lose-proof Daring Do. It was charming to an extent. The early days of playing a new and exciting game were marked by a lot of ideas and house rules to fit a romanticised version of your favorite characters and factions without regard to game balance. She remembered her early days doing the same and couldn't blame Dash for her ideas. Some weren't so bad or unworkable with changes. Others would have to be buried in the sea of bad ideas where it would join an endless association of poor ideas. She'd have to break it to her like the reality of poor design had been broken to her by a shop owner in Canterlot- through repeated experience of how unfun the game would become with them used. It was still nice to hear Dash get so excited about the possibilities the game presented. Finally, another pair of players in the area. And she didn't mean in the game of love, which she was sure they were playing intensely between the two of them. The game must have been at halftime as the incessant flirting between the two had died down in the name of food. No bother- Twilight's mind was already fitting together the pieces of a relationship born on the ground and destined for the clouds. She just didn't want to be under them when Carrot finally got there. They arrived at the Cafe and Rainbow Dash decided to introduce or greet everypony there before returning to tell them about the challenge. Well, as a Fet Loch stallion Twilight was sure that Carrot would oblige almost any silly request or conquer any challenge to impress his mare. "Well, I'm sure the noble stallion could do it. Too bad we have to wait until we are sea-" Twilight began before the owner of the establishment- or who Twilight assumed was the owner as his visage matched the pictures that littered the walls- approached her, bowing. "Princess! Y- we didn't know you were coming! You will be seated immediately!" He came up, a quick flash of photography by one of his employees capturing the moment he posed next to her. Twilight was taken aback as much by the flash as the suddenness of the move. She laughed nervously. "Table for three, I guess?" Carrot Fields was content to listen as Rainbow Dash and Twilight Sparkle talked in detail about their love of the Daring Do franchise, their own fan ideas, and even their one-upponyship of who was the biggest fan. He had no need to say anything himself, listening as two really cute mares speak so enthusiastically about something he also loved was more than enough; well that, and the view as one casually flew and the other trotted in front of him. Lost in his own romantic fantasy daydream following the pair, he was caught off-guard when they Dash announced they had arrived at the cafe. When she inquired about his prior attendance, Carrot shook his head in the negative, "Tae be honest, Ah huvnae really visited many ay th' shaps in Ponyville yit." He had seen the cafe in passing on his way to and from the market, but until now it never connected in his mind the cafe's name with the famous pony who shared the moniker. "Waittt.. is thes th' sam Hard Rock? Famoos aw pro wrestler Hard Rock? Hard Rock ay th' famoos peh splat finishin' move?! Ah remember seein' some ay his shows as a colt!" Carrot looked over the pictures with a curious eye, "Soooo, whit is th' contest?" Carrot was simply curious, he honestly didn't put any thought into competing as they were there for a quick lunch, that was until Twilight made a flattering comment towards his way, or at least he thought she was. He blushed but before he could say anything, Hard Rock himself was right there offering them a table, at the front of the restaurant, without even having to wait. The gray earth stallion wasn't dense to why. As Carrot sat on the stool looking over the menu, he couldn't help but wonder what the princess was getting at. She want him to try whatever silly contest there was here? Why? He wasn't sure how to be inquire further out of curiosity at first, then it hit him, he would just innocuously drop the question in with another. "Sae Ah heard th' horseshoe hay fries haur ur famoos Equestria wide, ye two ever try them? Also heard abit th' contests haur, whit dae ye baith hink ay those?" Dash grinned and, in an undertone, said to Twilight, "It's good to be the princess, eh? eh?" She gave a little nudge to her side as she encouraged her friend to enjoy the fame and prestige. Then at Twilight's comment - which sounded more like it should have come out of Rarity's mouth - and Carrot's apparent affirmation, she grinned. "Yeah, go Carrot! You can take 'im!" Hard Rock stood there, eyebrow raised, and grinned a huge grin. "So, gonna try the challenge? First one this week! I was starting to worry ponies were starting to get scared of the challenge!" Dash laughed and slapped Carrot on the shoulder. "Carrot here's not scared of anything!" Hard Rock laughed heartily. "Well, then, come on back, Carrot! ATTENTION EVERYPONY! Anypony who wants can come out back to watch! Carrot has issued... THE CHALLENGE!" Horseshoe hay fries were very nice. Twilight had not liked them for the longest time, a bit too overwhelming for her. She liked subtle tastes that danced on her tongue as opposed to hammers that sought to render her defenses meaningless. But lately her taste buds had undergone a revolution and horseshoe hay fries were finding themselves on the endangered Ponyville food list. Usually with a side of sea-salt and greens. And maybe a sandwich. Probably a beet sandwich. Washed down with several cups of cider warmed up by Celestia's sun. Truth be told her caloric intake had quadrupled since becoming an Alicorn and she still felt the urge to eat a lot of the time even after dinner. No wonder Celestia had an in-castle baker who got her the cakes she so desired. Being an alicorn was time consuming when it came to consuming. She was about to respond when a whirlwind of events cascaded on top of one another and conspired to draw them away and towards the back. Once out there what did they find but an old wrestling ring, the ring posts newely replaced but the ropes sagged a few inches from decades of use. Around it, a small crowd of rowdy patrons hooted and hollered in excitement as the owner, an old wrestler if Twilight understood it correctly, was on the top turnbuckle looking out to the crowd with his hooves in the air. And there was Carrot, who was just there. Twilight brought a hoof to her mouth in realization- were they going to have a match right here, right now?! That was incredibly silly. He wasn't a trained wrestler. Trying to impress his mare was one thing but Carrot could get seriously hurt! Twilight turned to Rainbow Dash with a concerned expression darkening her features. "Hard Rock is a professional! Carrot may have a nice, tone form with thick yet not egregious muscle mass as well as the stamina of a workhorse and he may even have his training and lifestyle to thank for undoubtedly quick and accurate hooves with a wonderful range of motion, but he isn't a trained wrestler! He could get seriously hurt. Somepony has to stop this," Twilight whispered to Rainbow Dash, face hard set as she stepped forward to put an end to the challenge before it began. A waiter appeared seemingly out of nowhere next to her and as if on a cue, her stomach unleashed a terrible growl. She really was very hungry. Her eyes wandered- above the back entrance was a sign with a picture of their delicious, delicious horseshoe hay fries. Decisions were made and her attention refocused elsewhere. "Uhh...I'll take...five...orders of horseshoe hay fries, please." How did this happen? One moment Carrot Fields was sitting with two beautiful mares: One an bookishly adorable princess, the other a lovely daredevil of the skies. It seemed like a sublime dream, which is maybe why it ended so suddenly for the stallion. In what felt like in a whirlwind flash, Carrot suddenly found himself behind the restaurant in a well worn and used wrestling ring opposite the retired famous wrestler, Hard Rock, a crowd cheering and chanting the famous sports entertainer's name in unison. Carrot briefly thought about vacating the ring, explaining how this was all a misunderstanding. It would have been the truth. He was merely curious about the challenges talked about in the restaurant, one he assumed had to do with eating the most oat burgers or something similar - not trying to pin one of the legends of the squared circle! He couldn't back out though, not with Dash and Twilight watching, and especially not with the rainbow maned pegasus telling him how she believed in him! He had to do it, for himself, for Fet Loch, for Dash! Wait.. am Ah fallin' fur 'er? "You dare to challenge me in my own house? You want to go one…on…one with the great one?! Take on Hard Rock in front of the thousands… and thousands of Hard Rock's fans?!!" The audience, which was better described as a few dozen than thousands, cheered and hollered in approval. Good grief, why was Carrot doing this? His brain yelled, "run, you dumbtail", but there could be no way, not with Dash there being his lone supporter. The things he did to try an impress a mare… She was just a friend after all, sure she was really cute and liked the Wonderbolts and Daring Do, but just a friend, right? He cracked his neck, rolled his shoulder, and looked up at Hard Rock. "Big bloke, arenae ye? Weel i've seen bigger!" Not that he'd ever wrestled Big Mac ... that had to be the lamest retort ever! Hard Rock just smirked at Carrot's pathetic comeback and quickly offered one of his own, "shut yer mouth and know your role!! Hard Rock will take you down Know Your Role Boulevard which is on the corner of Jabroni Drive and check you directly into the Smackdown Hotel!" The small audience cheered wildly; he would be too, if he wasn't the other pony in the ring. Fine! It was time to bring the 'A' game of taunts! Carrot thought back to those days as a colt where he and his friends would have little backyard wrestling matches behind the barn. The days when the ruddy maned stallion desperately wanted to be a pegasus. With his cape and mask he would call himself "The Rising Storm"; a little too ridiculous of a title to repeat here, but he could at least try one of his then "famous" taunts. "What's 'at? What's 'at noise? Dae ye hear a bit ay thunder?" He shook one hoof suggestively. "Haw abit some lightnin'?" He shook another hoof, as he grinned broadly. "Thunder? Lightnin'? Thunder? Lightnin'?" he taunted, circling closer and closer to Hard Rock. The crowd was stunned silent, either from its awesomeness, or out of sheer confusion. Before Carrot could say anymore he was close lined with a huge foreleg and found himself flat on the mat! How did that happen?? Where did that even come from??! Oh dumbtail, you really got yourself in it now!